The world is going to end overrun by bugs. By now it’s almost routine: the insects show up, the defenders of Earth unite to drive back the terror of the invaders, the aliens are too strong to resist and decimate the planet. Sure, there may be an eventual victory at the end, but humanity is reduced to a tiny fraction of its total numbers. We’re all going to die by giant bug attack, but at least there’s going to be some incredible explosions to highlight the world-shaking action of the resistance. No matter what incarnation Earth Defense Force takes it’s always going to be a symphony of bombastic gunplay against the innumerable forces of an unstoppable B-movie invasion. Before going into too much detail about Earth Defense Force: Iron Rain, though, a disclaimer seems appropriate. Iron Rain is a spin-off from the main Earth Defense Force series and a very different beast under the hood. 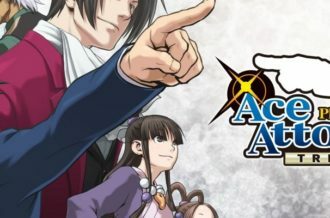 Sure, there’s a huge amount of weapons to choose from, many with incredible strengths offset by ridiculous weaknesses, all to be pressed into service in an attempt to hold back the dozens or hundreds of alien bugs and beasts found in each level. It’s also a new game by a different developer and so a very different flavor of EDF, so I’m going to mostly resist comparing it to the games of the main series. It would be like comparing Cherry Garcia to New York Super Fudge Chunk, in that you get the similar experience of tasty ice cream, but other than that there’s not a lot in common. So, taking it from the top. The aliens came out of nowhere, attacking Earth’s cities and decimating its defenses. After five years of warfare, being constantly driven to the edge of defeat, the EDF invented a new powered armor called the PA Gear. This allowed soldiers to wield much more powerful weaponry, finally giving humans the ability to go toe-to-toe against the overwhelming might of the Aggressors. During a major battle a lone soldier managed to hold on just long enough to bring down an incredibly powerful Hivecraft, but got caught in the explosion and ended up in a coma for seven years. On waking up they got right back into the war, given the code name Closer and assigned to the elite fighting group Blast Unit, but it’s a different world out there that’s been torn apart by the long years of warfare. 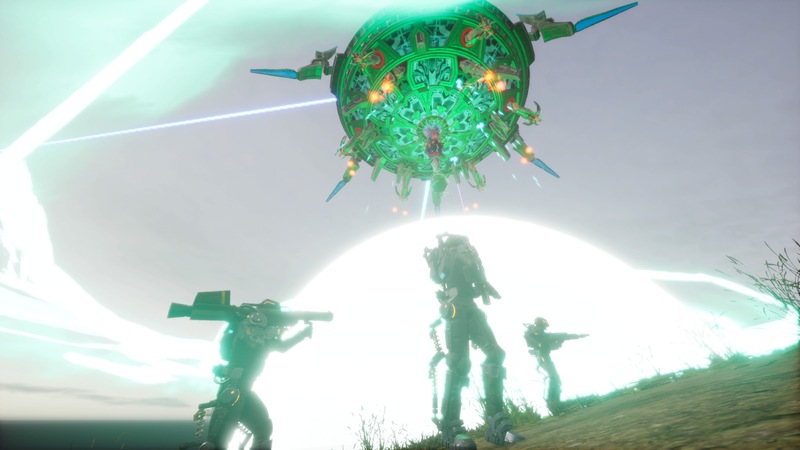 Morale is low, deserters have created a resistance group that fights the Aggressors in their own way, and much of the planet is abandoned to the invaders in order to let the EDF forces focus on defending its sponsors’ resources. It’s not a good situation, and even if Closer can somehow lead the EDF to a victory that reclaims the Earth for humanity, there’s no going back to normal. First, though, you need to decide who Closer actually is. The character creator at game’s start lets you choose gender, body type, face, hair, clothes, etc. It’s not so granular as to let you set individual facial features, but there’s a good variety of options to let you build an interesting character with more outfits that unlock as you earn them. You can rebuild Closer from scratch at any time between missions, so if you want an athletic woman with a purple mohawk in mismatched armor one day and a bald muscle-bro rocking an EDF t-shirt and jeans the next that’s perfectly fine. Closer’s identity is every bit as fluid as the weapon loadout and character class. Initially you start with two choices from the eventual four categories of PA Gear, each of which can use any weapon in the game. The Trooper is a ground soldier with good defense while the Jet Lifter sacrifices armor for flight. The power core that energizes the armor gives each its own special abilities, with a gauge on the bottom right of the screen showing how much is left. It refills relatively quickly but, when drained to zero, completely shuts down the abilities until the core cools off and the gauge reaches 100% again. For the Trooper this isn’t such a big deal, seeing as it’s used for a power dodge, but it’s easy to be left with nothing while using the Jet Lifter’s flight ability. Once you’ve got about a dozen missions into the game the Heavy Striker armor opens up, which basically turns you into a walking tank. The Heavy Striker dual-wields its weapons with the trade-off being that it both moves and reloads more slowly than any other class, but its energy core abilities are a shield and the lower body seeming to turn into a tank for faster movement. After a few more missions in the last, best PA Gear opens up, the Prowl Rider. The Prowl Rider’s power core feeds a grapple, letting you latch on to enemies or buildings to zip across the battlefield. It’s not as mobile as the flight from the Jet Lifter, but the better armor makes up the difference and being able to close the distance to an enemy quickly means the new sword weapon category becomes far more useful. Each of the PA Gears also comes with an Overdrive capability, used once per level, and the Prowl Rider gets the best of this as well. While the other three classes get infinite core energy, fast firing and fast reload, the Prowl Rider instead summons a tamed alien insect to ride. 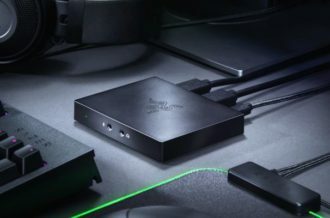 The ant can walk up walls, the spider is a giant spider with eight legs so its abilities will be a mystery forever, and the scorpion has insanely powerful pincer attacks that can decimate huge enemies with ease. Once I’d unlocked the Prowl Rider I switched exclusively to this armor and never looked back. 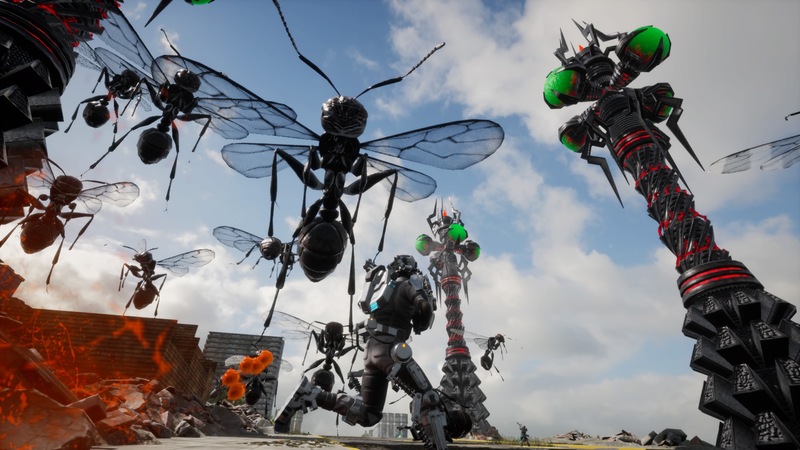 Once you’ve got a Closer to make you happy it’s time to start killing some bugs, with missions that play out in the standard Earth Defense Force style. The setting may be the West Coast of the US this time around, including desert, oceanside, city and a hilly urban area in San Francisco, but exterminating giant ants feels good wherever it happens. At the start of the game you’ve got a couple of assault rifles, shotguns and a rocket launcher or two, but each successful mission expands the arsenal. You can only carry two weapons at once, though, so you’ll want ones that complement each other. A close-range shotgun packs an incredible punch but has a small magazine and its reload time can be a few seconds, while an assault rifle doesn’t quite do the same damage but fires faster with a quicker reload time. The grenade launcher doesn’t have anything like the range of a missile or rocket but it packs an incredible punch, plus it’s a lot of fun to lob one right in the face of the several-story-tall Sideros monsters. The arsenal is as varied as ever, with some weapons that are instantly obvious in how you’d use them and others requiring specialized encounters to ever be considered. A grenade might land a hefty 150 points of damage with a large blast radius, making it an easy choice to bring into battle, but the rocket that does several thousand points in a single hit and then requires 29 seconds to reload is the kind of thing you’d only pack when you know you’ll be fighting a single large enemy. As you blast your way through the missions, taking down ants, flying drones and a particularly disturbing new type of spider that carries a swarm of baby spiders on its abdomen, the defeated enemies sometimes drop a gem. The gems come in four different colors, with the green being an instant shot of health while the red, blue, and yellow ones are used as currency back at the base. Once you’ve completed the mission by taking out all invaders and giant rampaging kaiju-monsters, the level tallies up your performance by time, damage taken, gems collected and a technical score based on not overheating the power core and not shooting your teammates. This leads to a cash reward and here things start falling apart a bit. 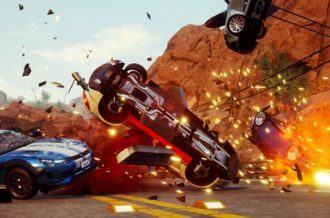 While the action is solid, albeit harder than any other entry in the series, the economy is busted. New weapons cost money, new outfits cost money, unlocking items costs money, using items on the battlefield costs money and after a while it feels like the game is nickel-and-diming you to death. While I said Iron Rain is harder than any previous entry in the series, that’s probably because I couldn’t bring myself to use grenades or other high-power items because there’s a cost that’s subtracted from the final mission reward for it and I’d rather save that money to buy new weapons. 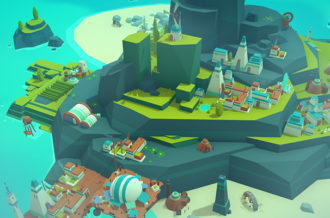 Saving the world is one thing, saving it on a budget that says leveling entire city blocks is OK, but a grenade is an extra expense is something else entirely. 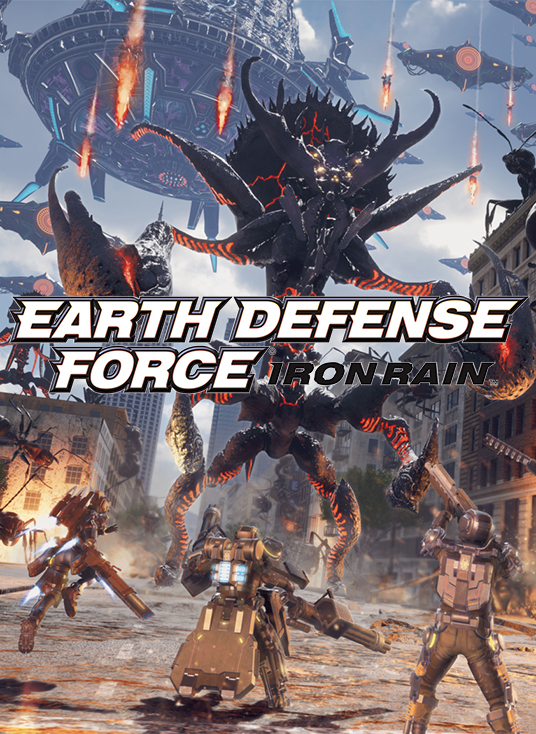 Earth Defense Force: Iron Rain is a different beast than the standard series but still an incredible pure-action run & gun shooter. The epic battles are filled with giant set pieces, each mission is different from the last and the monster designs range from series-standard ants to monstrously huge creatures that feel like they could carry a full level on their backs. 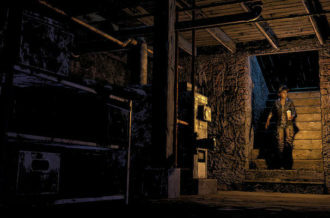 The difficulty tends to be all over the place, with some missions taking a single attempt and others requiring significant experimentation before finally squeaking through, but even when the repetition gets frustrating, there’s a path through the chaos if only you can figure out the right tactics and weapon combination to find it. 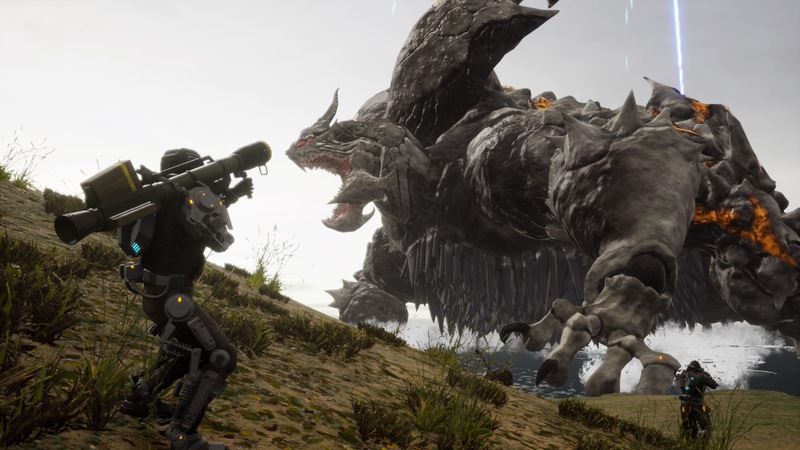 Earth Defense Force: Iron Rain may be a different type of EDF but its heart is powered by the epic bug-blasting, kaiju fighting combat that has always been the hallmark of the series’ wonderfully insane take on alien-invasion warfare.